Wondershare Streaming Audio Recorder features out as a powerful streaming audio detector and recorder which can sense any tiny audio signal pass by the sound card and record it with high fidelity for your reserve, such as the playing music, video clips, movie, webcasts, softphone, message audio, etc. Besides, you can set the record time, split audio files, filter out ads, edit ID3 tags, add to iTunes, make your own ringtone, etc. 1. Record online audio. Detect any audio signal walking across your computer, record them in real time and save as MP3, M4A format that compatible with your iPod, iPhone, iPad, PSP, Apple TV, Zune, and so on. 2. Wide range audio source. Supports music from online store like iTunes, Napster, Yahoo music, Pandora, or the audio signals from your video clips, movie, online radio, web casts, and more. All of them can be captured by Wondershare Streaming Audio Recorder. 3. High audio fidelity. 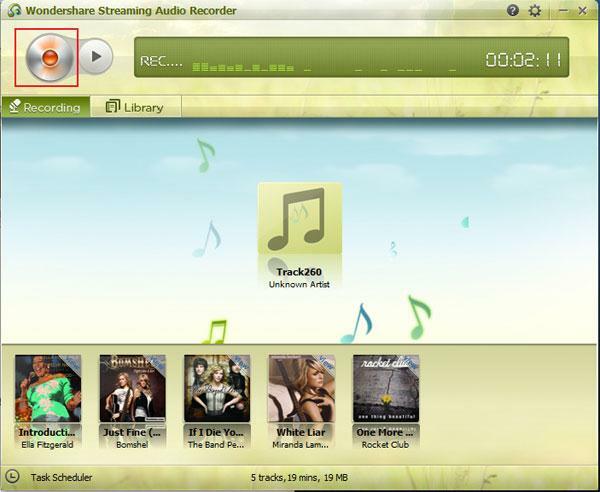 Wondershare Streaming Audio Recorder works with an independent virtual sound card which records streaming audio or music with high fidelity. 4. Adjust Audio effect. You can customize the output audio effect by adjusting the sample rate, bit rat, etc. 5. Search and edit ID3 tags. Smartly recognize song information, and edits ID3 tags as title, artist, album, and genre. Helps to make your own music library at ease. 6. Make ringtone. Create a ringtone from recorded audios by chopping a whole audio file into subsections as you like. Previewing is available. What’s more, the embedded timer can free you away when it works with preset recording duration. 7. Add to iTunes & Windows Media Player Intellectually. Add the recorded audio files to iTunes library and Windows Media Player’s playlist by one-click sending. Thus you don’t have to bother adding them manually. 8. Share onto Twitter. One click to share your music playlist easily with friends and family on Twitter. Sliverlight Video Capture Control SDK (Popularity: ) : For Web or Window Developers who need to Video Capture processing on Window and Mac OS X or browser-based application.